Thank you all for posting your copycat recipes on the internet! Now that I live alone, it’s sometimes hard to find someone to join me for dinner or when I crave a particular menu item from a distant restaurant, so I’ve turned to these recipes. It’s also a great way to cut out salt and fat by adapting the originals, because nothing packs on the pounds like dining out. Before the internet, I either bought the chef’s cookbook (Thomas Keller, Danny Meyer, Daniel Boulud, Roy Yamaguchi, Paul Prudhomme, even California Pizza Kitchen) or experimented. Now, all you need is a Google-search. 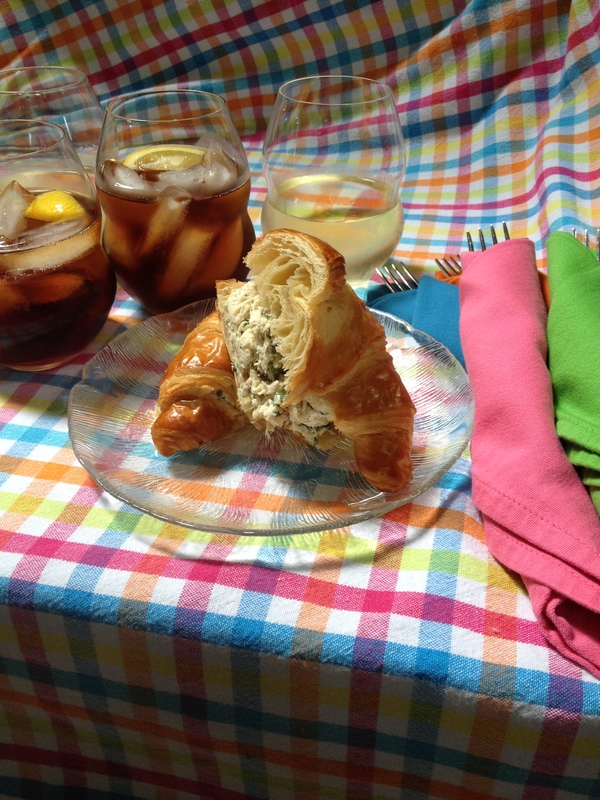 One of the first dishes I ever duplicated was a chicken salad on croissant from a long-defunct café at Baltimore’s Inner Harbor. It was simple with a twist, flavored with tarragon, one of my favorite herbs. I don’t even know if my current incarnation is anything similar to the original recipe, but it’s always a hit and has been reproduced in church and school cookbooks and passed around by friends. If you recall from my post on The Mayonnaise Wars, tarragon effectively masks the taste of the mayonnaise, which I find — well — distasteful. The traditional celery adds crunch, along with my addition of sliced almonds, and a little lemon juice brightens anything. Served on a buttery croissant, with or without a little red-leaf or butter lettuce, it’s just about my favorite lunch. 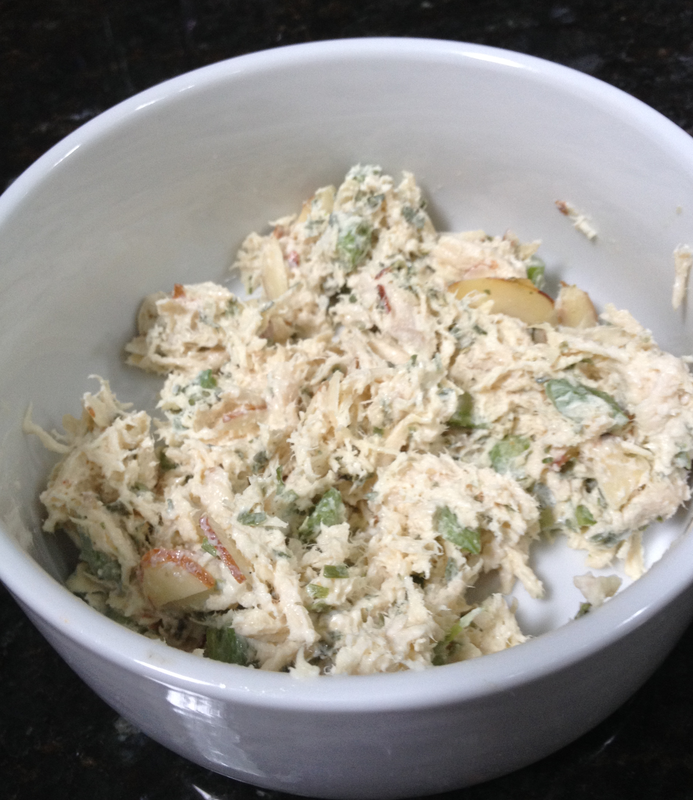 When The Daughter attended Salisbury University, in Salisbury, Maryland, I found a chicken salad that I like almost as much, and I’ve been craving it since she graduated and moved back home. The Acorn Market (three long hours away) serves the second best chicken salad I’ve ever eaten, which seems to be just chicken breast chunks, mayonnaise, and honey. No crunchy stuff. No fruit. But not bland. They even give you a nice piece of shortbread to go with it for dessert. Since I can’t find a recipe for it or convince The Daughter to go back to graduate school, I’m going to experiment with it. I’ll let you know how it turns out. If I’m trying to stretch it into a formal luncheon, I serve a little cucumber-dill salad on the side and chilled white wine. If I’m on a boat or at a picnic, I serve something easy and chocolate for dessert, but, now that I think of it, I should serve my scrumptious shortbread. Categories: Food | Tags: chicken, Cooking, recipes | Permalink. 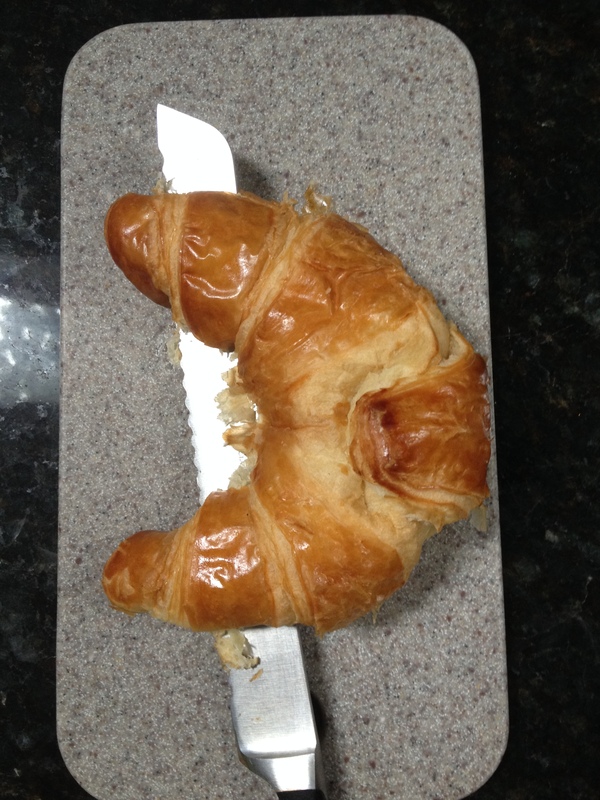 Since I live in France and I can get my hands on some good croissants…I’ll have to try this. Thanks! De rien, Paula! I’ve actually made them in France, too, where the store-bought mayo is better, too. My French friends used to think I was nuts for turning croissants into sandwiches, but I’ve seen some simple ones on my last two visits. I look forward to reading your blog. Merci!